Not to be confused with 1961-1962 ABC sitcom called Margie starring Cynthia Pepper. For the 1920 jazz standard, see Margie (song). 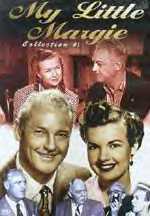 My Little Margie is an American situation comedy starring Gale Storm and Charles Farrell that alternated betweenCBS and NBC from 1952 to 1955. The series was created by Frank Fox and produced in Los Angeles, California at Hal Roach Studios by Hal Roach, Jr. and Roland D. Reed. My Little Margie premiered on CBS as the summer replacement for I Love Lucy on June 16, 1952, under the sponsorship of Philip Morris cigarettes (when the series moved to NBC for its third season in the fall of 1953, Scott Paper Company became its sponsor). In an unusual move, the series—with the same leads—aired original episodes on CBS Radio, concurrently with the TV broadcasts, from December 1952 through August 1955. Only 23 radio broadcasts are known to exist in recorded form. Set in New York City, the series stars Gale Storm as 21-year-old Margie Albright and former silent film star Charles Farrell as her widowed father, 50-year-old Vern Albright. They share an apartment at the Carlton Arms Hotel. Vern Albright is the vice-president of the investment firm of Honeywell and Todd, where his bosses are George Honeywell (Clarence Kolb) and Todd (George Meader). Roberta Townsend (Hillary Brooke) is Vern’s girlfriend, and Margie’s boyfriend is Freddy Wilson (Don Hayden). Mrs. Odetts (played by Gertrude Hoffmann on TV, Verna Felton on radio) is the Albrights’ next-door neighbor and Margie’s sidekick in madcap capers reminiscent of Lucy and Ethel in I Love Lucy. When Margie realizes she has blundered or gotten into trouble, she makes an odd trilling sound. Michael Richards of Seinfeld cites this as the inspiration for the occasional odd vocal utterances of his character on the program. My Little Margie finished at #29 in the Nielsen ratings for the 1954-1955 television season and, even more impressively, at #6 in Nielsen’s radio estimates for the 1954-55 season. Despite this success, the series was canceled in 1955. Gale Storm went on to star in The Gale Storm Show which ran for 143 episodes from 1956-1960. Zasu Pitts joined Gale Storm in this series too, originally entitled Oh! Susanna. The show has been compared with two other 1950’s sitcoms which aired at the same time, I Married Joan and Life with Elizabeth. All three programs were inspired by the success of I Love Lucy, but despite their own merits, have fallen into obscurity only to gain some popularity after entering the public domain. I Love Lucy, however, is still under copyright in the United States. The program’s theme song was originally titled “Bows and Strings in Teasing” by its composer, Alexander Laszlo, when he composed it for a 1946 Republic Picture,The French Key. When My Little Margie contracted to use his music, Laszlo wrote a new arrangement with added bars of music, which then became the “My Little Margie Theme” from 1952 to 1955. The show’s music should not be confused with the 1920s popular song “Margie,” also known as “My Little Margie,” though the title of the TV program may have been inspired by the song. Most of the surviving radio episodes are edited versions aired on the Armed Forces Radio Service (AFRS). CBS destroyed thousands of broadcasts from this period, so in many cases all that have survived have been the AFRS versions. The AFRS versions used the 1920s song ‘Margie’ as a music fill at the end of the episode to take up the time that would have had commercials in the original CBS version. Since the series was canceled in 1955, My Little Margie has aired on local TV stations, often paired with I Married Joan. Both series aired on CBN during the 1980s and then on ION. Jump up^ “ClassicTVHits.com: TV Ratings > 1950’s”. classictvhits.com. Jump up^ “The Busy Air”. Time magazine. February 7, 1955. Retrieved 2009-01-07. The Nielsen ratings of the top ten radio shows seemed to indicate that not much has changed in radio: 1) Jack Benny Program (CBS), 2) Amos ‘n’ Andy (CBS), 3) People Are Funny (NBC), 4) Our Miss Brooks (CBS) 5) Lux Radio Theater (NBC), 6) My Little Margie (CBS), 7) Dragnet (NBC), 8) FBI in Peace and War (CBS), 9) Bergen and McCarthy (CBS), 10) Groucho Marx’s You Bet Your Life (NBC). This page was last modified on 7 May 2016, at 02:41.